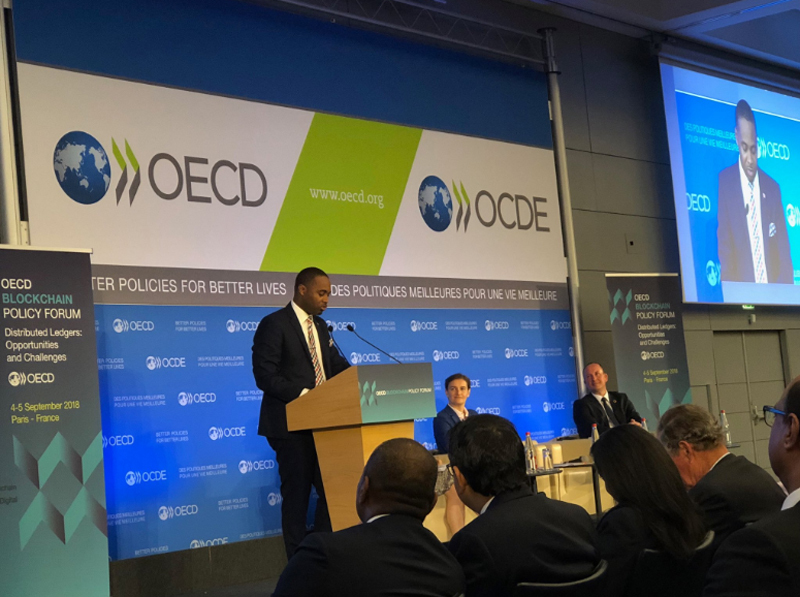 Premier and Minister of Finance David Burt is currently in Paris, where he addressed the [Organisation for Economic Co-operation and Development [OECD] Blockchain Policy Forum on “Distributed Ledgers: Opportunities and Challenges”. “The prestigious conference was hosted in Paris by the Director General Angel Gurría and chaired by the Senior Editor of the Economist, Anne McElvoy,” a government spokesperson said. “In May, legislation governing Initial Coin Offerings in Bermuda was enacted, requiring potential investors and owners to meet the ‘Bermuda Standard’ on beneficial ownership and transparency, one highly regarded by regulators the world over. “The Digital Asset Business Act, and related legislation, which is fully administered by the Bermuda Monetary Authority, is expected to serve as a global model of best practices for regulation of digital asset service providers. “Bermuda amended its banking laws to created the Restricted Banking Act which allows banks to set up in Bermuda to service companies that provide digital asset services in Bermuda. Referring to his address, after the Forum, Premier David Burt said, “We are already well known as the risk capital of the world, with billions of dollars in reinsurance claims being resolved from our pink sand shores. He continued, “Bermuda is a world leader in the FinTech regulatory environment. We are on track to introduce an E-ID programme [later this year]. “We plan to leverage our ability to be nimble, our experience in crafting and enacting quality regulation, and our business-friendly environment to continue to deliver to the world a prime jurisdiction for digital financial assets. “The world’s future will be fuelled by continued technological innovation of digital assets based on the trusted nature of Distributed Ledger Technology. Hey Mr. Premier; you’ve been away a while. Were tired of Col. Burch’s chicken. The countries have been dubbed as “Crypto Valley” by some for their cryptocurrency-friendly policies. I love Paris. I wish someone would pay for me to go there and talk about something.